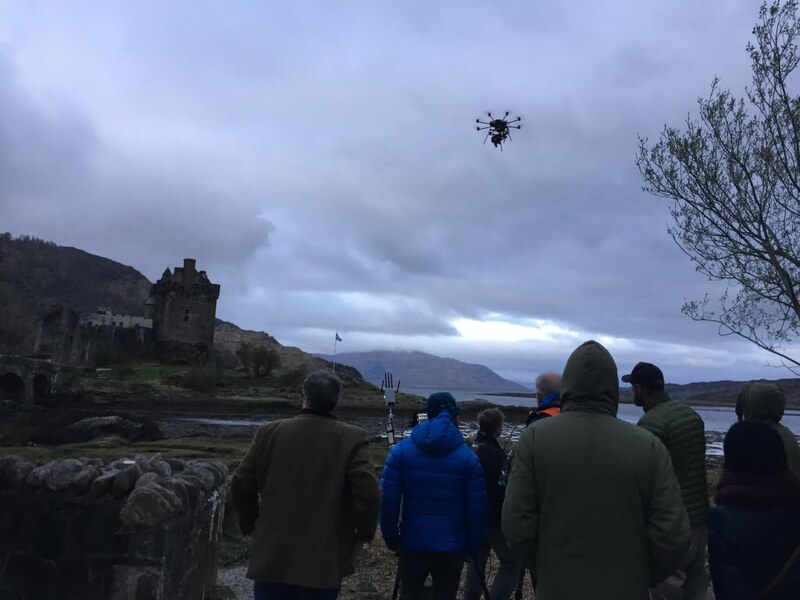 LA Media‘s drone team was recently booked by David Taylor Production Services to use our drones to film Eilean Donan Castle. The client in question was soft-drink giant Schweppes. Working alongside a Spanish crew and Norwegian director we brought our Scottish drones to the mix to help bring together this project. It simply doesn’t get more iconic or more Scottish than Eilean Donan Castle. Eilean Donan is world renowned as one of the most scenic and historic Highland castles. Nestled in the very heart of Scottish history the castle is located on an island at the point where three great sea lochs meet. Surrounded by traditional Scottish scenery, it’s little wonder that the castle is now one of the most visited attractions in the Highlands. Originally built in the 6th century, it became the first fortified castle to be built in the mid-13th century and stood guard over the lands of Kintail. Since then, at least four different versions of the castle have been built and re-built as the feudal history of Scotland unfolded through the centuries. When you stand there on the location you can’t help but get a real sense of history. It’s hard not to be impressed by the castle. With majestic backdrops and moody ever-changing skies, it’s basically a photographer’s dream! The director wanted to capture the beauty of the castle at sunrise and sunset, which meant a 5 am call time! It was a very long shoot day but we did get a mini siesta between flights. This was a heavy lift job and required ultras prime lenses on an Arri Alexa Mini recording at 4K. The flying rig was a SKYJIB octocopter with a Movi 15 gimbal. It was surprisingly cold at 5.00am and the day’s weather featured sporadic rain all day long. This resulted in the usual conflict between client and pilot, deciding whether it was in fact raining or not….this happens more often than you’d believe. It is an understandable conflict, the client wants value for their money and the drone in the air while the pilot has the responsibility of deciding if it is safe to fly or not. After all, if the drone comes down the responsibility will lie solely on the operator. Even if the rain is a light mist you still risk a major catastrophic failure in flight. It can be torture for the ground crew: we’re in the perfect location with the right backdrop but not the right weather. But rain is rain, water plus delicate electronics simply isn’t safe and our pilot Pete did a great job of sticking his guns. In the end, we waited and but got the shot safely. The client was still happy at the end of the shoot and we flew our rig safely. With misting rain and sporadic showers, you will often find there is a small break in the rain. That break is your window – you will be able to get the drone up and get the shot your client wants without being dangerous. The most difficult aspect of this shoot was that the castle had been double booked! As we’ve mentioned the castle is a popular highland destination but is also a highly sought after wedding venue. This meant that we had to get in and get our drone shots without disturbing the wedding that was happening at the venue! Luckily everything went smoothly – and without a hitch – and we had a happy client. There’s no I in TEAM! We’d like to extend big thanks to David Taylor who did a great job on location and looked after us very well. We’d also like to thank Pete Maughan (drone pilot) and Richard Elliot (gimbal operator) who both did outstanding work on this shoot.